It is a brave step to make an hour long demo consisting of only a handful of different riffs. One is at first captivated by the strange atmosphere that erupts from these such simplistic melodies. It seems to be continually trudging onward to someplace unknown. A person unfamiliar with the work will be immediately shocked by how often these few riffs repeat themselves, but after one has listened to it several times in its entirety, it instead becomes a meditation upon lost ruins and misty visions. It will quickly fade from one's immediate perceptions, as the listener drifts into a trance. The low quality of the tape and sloppy playing both contribute to the feeling that this song truly is both ghostly and forgotten. It seems that Mortiis somehow predicted even so far back that this work would be just the mysterious prize a curious dreamer would be most excited to find in his search through obscure music. It something wholly inaccessible to the common listener, both in terms of discovering and listening, and yet for those who are patient and willing to get lost in the strange hypnotic reverie, the reward is an experience of something both magical and horrific. The ghost is no doubt from an age lost to both our world and our myths. The ghost would not wander about the ugly places of the day-to-day; like all ghosts it would avoid living humans, except for those brave enough to enter the crumbling ruins of the tower, the darkness beneath which the ghost haunts eternally. And perhaps, to that poor soul who ventures into such a cold and decaying place, the ghost will whisper secrets, so quietly that he wouldn't be sure whether it was the voice of that forgotten spirit, or the steadily waning sanity of the dreamer who shivers in the dreary tomb. What might be the secrets of the ghost? Perhaps it whispers of the weird magic it used to wield in the life that it's not sure it ever lived, or perhaps it whispers of how that tower was rotting long before it arrived, already filled with forgotten spirits that have since faded to nothing but a fleeting scent on the air... or perhaps it whispers of the black and endless horrors that lie beyond that crumbling stone wall, the madness that no curious dreamer ever predicts, until it is too late and they are consumed by the despair of the infinite abyss. This is the true way of dungeon synth, an ancient place of darkness in which dreamers choose to sit and meditate, that they might get but a vague taste of that elusive something that is somehow so far beyond mere art, and always seems to get a little further from grasp the closer one gets to it. I encourage none to listen to this song, to visit the haunted ruins of the Long Forgotten Ghost. This is a place of despair, and if one adjusts to it and begins to feel a bond with that ghost whose songs are so mysterious and so distant from the stuff of life, then one will find that before long it is they that eternally haunt that musty crypt. I listened to this today and was completely blown away. I've heard dungeon synth before (Depressive Silence for the most part) and this was just a completely trance inducing experienced that completely immersed me in my own little world deep below the earth alone in a faintly torch-lit, stone corridor. I'm glad you liked it. It's one of the most challenging dungeon synth works, in my opinion, and certainly not the best of the genre, but it's rewarding in a way quite unlike anything else. Fantastic, both the music and your interpretation. 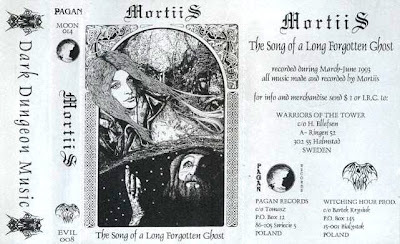 I've had "Keiser av..." on rotation for a while but never tried Mortiis' demo until now. It is truly entrancing in a bleak way, something for those special moments when the stars are right. I'm glad you see the magic in it as well.